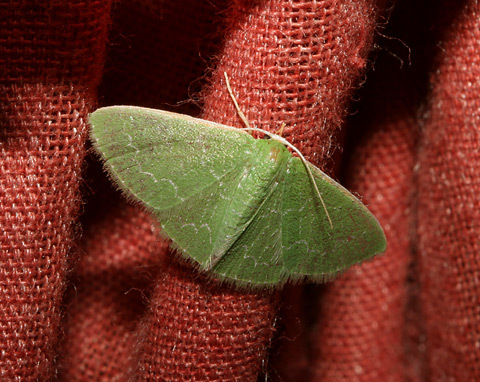 One autumn evening, I found this small, green moth clinging to the curtains in my living room. It's a Southern Emerald Moth (Synchlora frondaria), one of the many Green Geometrids or Green Inchworm Moths in the family Geometridae, subfamily Geometrinae, also known collectively as Emeralds. Inchworms are also known as measuring worms or loopworms due to the unusual way the caterpillars move along. An Inchworm stretches out and grabs onto something with it's front legs, and then lifts it's middle up into a loop as it draws it's rear appendages (prolegs) up to it's front legs. The inchworm then holds on with it's rear appendages as it again stretches out forward. Inchworms are quite amusing to watch, although most I've seen are small and don't quite measure out an inch as they loop along.